Blood vessels supply blood to various part of the human body. Veins and arteries are examples of vessels that transmit blood towards and commencing in the heart. White blood cells, red blood cells, plasma, and platelets make up blood. Usually, blood flows easily all the way through the veins and arteries; however, if the intima of a blood vessel experiences an injury, compound mechanisms begin inside the bloodstream to produce a clot where needed. A blood clot is produced because of the opening of thrombocytes within the blood in which they begin the clotting action effecting the production of fibrin that is responsible to create the net that creates a clot. During the creation of a blood clot formed in a blood vessel, these are called either a thrombosis or embolisms; however, they are considerably diverse from one another. When the blood clot is produced within a vein or an artery and blocks the flow of blood, it is called a thrombosis. This clot is termed a thrombus. Embolism is when the whole or a portion of the blood clot separates itself from its place and travels as an obstruction to a different part of the human body. This clot is called an embolus. There are two classifications of thrombosis which are: arterial thrombosis and venous thrombosis. Venous thrombosis is produced when the thrombus is produced in a vein. It is called an arterial thrombus when the blood clot is created in the artery. Venous thrombosis can refer to deep vein thrombosis (DVT), renal vein thrombosis, and portal vein thrombosis regardless on the site of the blood clot formation. Arterial thrombosis may cause a myocardial infarction or a stroke. Embolisms are categorized as venous embolisms and arterial embolisms. The outcome during the occlusion of a vessel in any component of the human body due to the moving embolus is called an arterial embolism. Ischemic stroke results when the embolus arrives at the brain. Blockage of the brain because of an embolism is known as a venous embolism. This results in a pulmonary embolism. In thrombosis, injury and hypercoagulability to the endothelial lining of the blood vessel are caused by the disturbance in the flow of blood. One main cause of an embolism is a deep vein embolism. In this situation, a blood clot is produced deep within the vessels of the thigh. Atherosclerosis, endocarditis, atrial fibrillation, and mitral stenosis can also be causes of embolisms. Indications for DVT consist of swelling, pain, warmth, and redness in the leg as these happen due to difficulty with the flow of blood reversing back to the human heart causing blood to build up in the leg. Cough, shortness of breath, excessive sweating, chest pain, and irregular heartbeat are indications of a pulmonary embolism. If the clot is inside a vein, management comprises the utilization of blood thinners or anticoagulants and compression socks to ease the pain in the calf and bulging. If the blood clot is within one of the arteries, physicians take care of it by using prescriptions to dissolve the clot or carry it away by surgery. Anticoagulants, antiplatelets, thrombolytics, and painkillers are examples of the doctor’s prescription. The physician can suggest embolectomy or an arterial bypass and angioplasty in which the embolus is isolated by surgical procedures when the flow of blood is entirely blocked by an embolus. 1.Blood vessels supply blood to various part of the human body. Veins and arteries are examples of vessels that transmit blood towards and commencing from the heart. 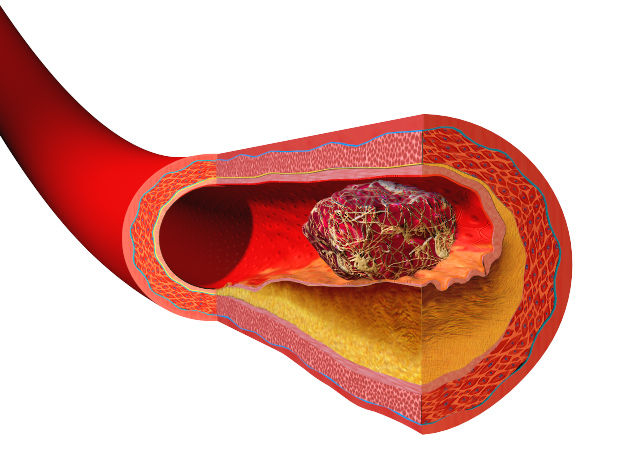 2.When the blood clot is produced within a blood vessel and blocks the flow of blood, it is called a thrombosis. Embolism is when the whole or part of a blood clot separates itself from its place and causes an occlusion at a different part of the human body. 3.Venous thrombosis is produced when the thrombus is formed in a vein while arterial thrombosis is when the blood clot is created in the artery. Arterial thrombosis may cause stroke, myocardial infarction. Embolisms are categorized as venous embolisms and arterial embolisms. 4.In a thrombosis, hypercoagulability and injury to the endothelial lining of the blood vessel is caused in the disturbance of the flow of blood. 5.If the coagulate is inside a vein, management comprises the use of anticoagulants and compression socks to ease the calf pain and bulging. Anticoagulants, antiplatelets, painkillers, and thrombolytics are examples of the doctor’s prescription. golden. "Difference Between Thrombosis and Embolism." DifferenceBetween.net. August 14, 2018 < http://www.differencebetween.net/science/health/difference-between-thrombosis-and-embolism/ >.